The endocrine system is an important and complex topic of the preclinical studies. The control of bodily functions through the messengers (hormones) of the endocrine system is the subject of anatomy, physiology and biochemistry; an accurate understanding of the hormones and their functions is essential for the clinical routine as well. The endocrine organs, in the stricter sense, include pituitary, thyroid, parathyroid, adrenal gland and pineal gland. 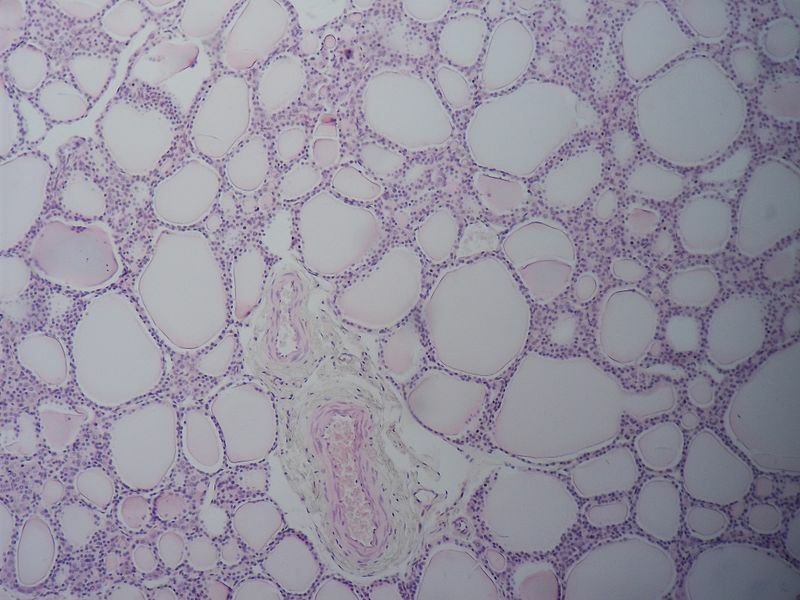 They are easy to identify by their characteristic structure in the histological examination, but there are several things that should be considered. This article summarizes the most important facts about the endocrine organs. Are you more of a visual learner? Check out our online video lectures and start your histology course now for free! The endocrine system consists of those organs of the body that are producing hormones. Many different bodily functions are coordinated and regulated by hormones, i.e., metabolic regulation, water and electrolyte balance, maturation and growth processes as well as reproduction. Serving as messengers, hormones reach their target cells via the blood. Endocrine glands are glands producing hormones and delivering them to the bloodstream. Contrary to the exocrine glands, endocrine glands do not possess excretory ducts. They deliver their product directly into the bloodstream or they act in an autocrine or paracrine manner. For this reason, the endocrine tissue is usually provided with many capillaries. 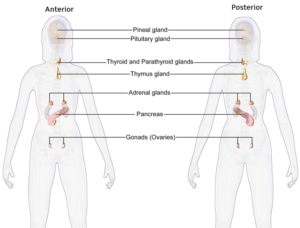 The endocrine glands, in the stricter sense, include pituitary, thyroid, parathyroid, adrenal gland and pineal gland. In addition, there are organs with endocrine cell groups, like the ovary, testes and the gastro-intestinal tract – the latter containing even more endocrine cells than the adenohypophysis. The pancreas, with its islet cells, the thymus, heart and kidneys produce hormones as well. As these organs also perform other essential tasks, they are not primarily regarded as endocrine glands. 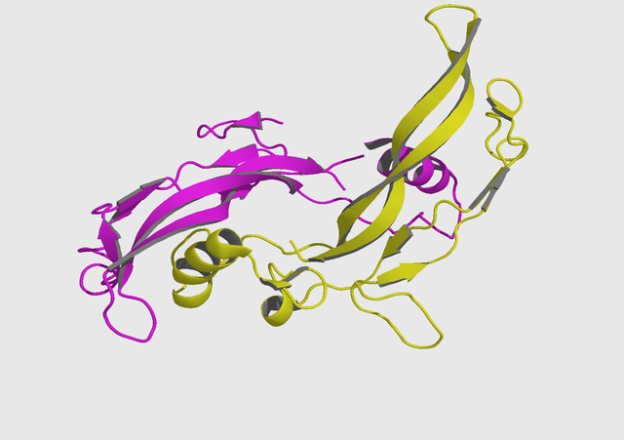 Peptide hormones (such as insulin) are usually produced as prohormones and stored in granules in the cell. Cells producing peptide hormones feature a rough endoplasmic reticulum and a prominent Golgi apparatus. In the cytoplasm, there are small secretory granules whose content is released via exocytosis. Steroid hormones are lipophilic molecules whose structure is derived from cholesterol. Examples of steroid hormones are testosterone and estrogen. They are not stored, but leave the cell by diffusion. Cells producing steroid hormones are characterized by a smooth ER, tubular mitochondria and lipid inclusions. Secretory granules, however, are not found in these cells since steroid hormones diffuse into the blood immediately after their synthesis. Endocrine signaling occurs if an endocrine organ, such as the thyroid, secretes its hormone into the blood. The hormone is spread throughout the body via the bloodstream and thus reaches its target cells. Nerve cells may form hormones as well. If these are secreted into the blood, the process is called neuroendocrine secretion. In paracrine secretion, however, hormones diffuse through the connective tissue to their vicinal target cells. These hormones are also called mediators or tissue hormones. They include, among others, the cytokines, histamines, NO, serotonin and bradykinin. Autocrine secretion means that the hormone produced by the cell reacts to the same cell. The cell thus affects itself. This process is especially important in the differentiation of cells in the embryonic development. Autocrine and paracrine signaling play a role in inflammation processes and immune reactions, among others. The boundaries between the mechanisms are not completely defined. Hormones like insulin may act in an endocrine as well as paracrine and autocrine manner. The Hypothalamus is part of the diencephalon (interbrain) and serves as a super-ordinated structure of the hormone system and the autonomic nervous system. Certain hypothalamic nuclei (nerve cells) form control hormones, which regulate the hormone production of the adenohypophysis. In addition, the large perikarya of the hypothalamic nuclei Ncl. supraopticus and Ncl. paraventrikularis produces both effector hormones ADH and oxytocin. These are bound to carrier proteins and transported into the neurohypophysis along the axons. The neurohypophysis (posterior lobe of the pituitary) consists of neural tissue. Here, no hormone production takes place. Instead, the axons of the hypothalamic nuclei, which produce oxytocin and ADH, end here. This is where the hormones are released into the bloodstream, which is why this area is called a neurohemal region. ADH and oxytocin are nonapeptides. ADH (vasopressin) ensures reduced water excretion in the kidney. If there is an ADH-deficiency, i.e., through traumatic destruction of the pituitary stalk, the condition of diabetes insipidus will occur. Here, large amounts of hypoosmolar urine are excreted. Cells of other hypothalamic nuclei produce the releasing and inhibiting hormones (liberins and statins). These are transported axonally in the eminentia mediana (pituitary stalk) and secreted into the bloodstream there. The hormones reach their target cells in the adenohypophysis through portal vessels. They affect them either in an activating or inhibiting manner. The pituitary gland (Latin glandula pituitaria) is about the size of a hazelnut and weights 600g. It is located at the base of the brain, directly below the hypothalamus in the sella turcica of the sphenoid bone. It is enclosed between the inner and outer layer of the dura mater. In the histological sectional image, it is easy to see that the pituitary consists of two parts: the adenohypophysis (anterior lobe of the pituitary) and neurohypophysis (posterior lobe of the pituitary). The neurohypophysis is connected to the hypothalamus through the infundibulum, the pituitary stalk. The neurohypophysis is a protuberance of the midbrain and therefore consists of nerve tissue. This is the endpoint of the axons of the neurosecretory neurons of the Ncl. supraopticus and Ncl. paraventricularis. Their hormones, oxytocin and ADH, are stored in granules and released into the blood via exocytosis when needed. There is no hormone production in the neurohypophysis itself. 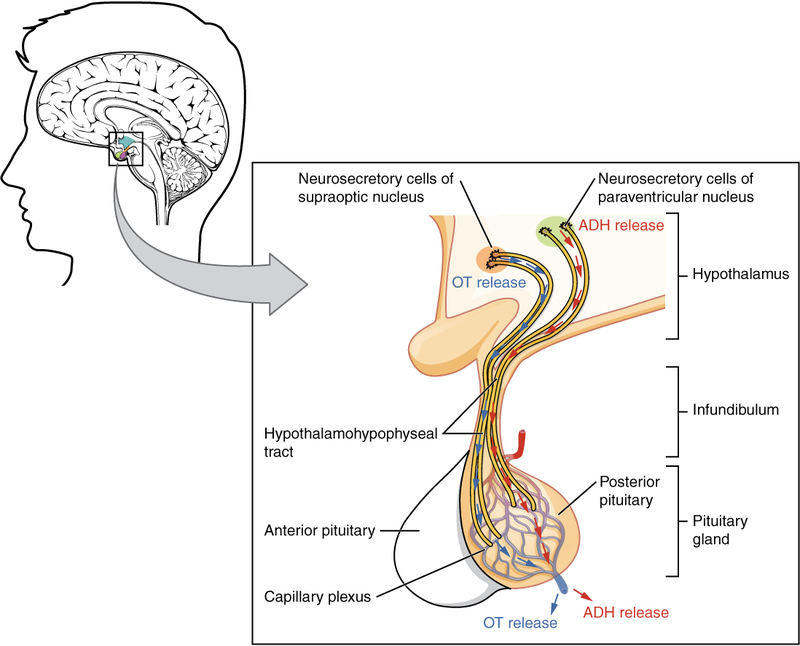 Instead, the neuroendocrine hormones reach the posterior pituitary via axonal transport. They are secreted into the blood here, in the so-called neurohemal region. Thus, the neurohypophysis is a part of the circumventricular organs (circumscribed areas where the blood-brain barrier is lifted). Moreover, particular glia cells with visible cell nuclei (pituicytes) and capillaries with endothelium, can be found in the neurohypophysis. The pituitary portal system is located in the area of the infundibulum as well. Here, vessels of the eminentia media (also a neurohemal region) transport the releasing and inhibitory hormones, which are produced in the hypothalamus, to their target cells in the adenohypophysis. The adenohypophysis (anterior lobe of the pituitary) is constructed of epithelial cells and has a rich blood supply. It can be divided into three regions: the pars distalis, located in the front; the pars intermedia, with its transition into the posterior pituitary; and the pars tuberalis located next to the pituitary stalk. There are three different types of cells: acidophilic cells (colored red in the H & E stain), producing prolactin and growth hormones, and basophilic cells (colored blue in the H & E stain), secreting MSH, ACTH, TSH, FSH and LH. Furthermore, there are rare chromophobe cells that are unstained and presumably consist of exhausted endocrine cells as well as stem cells and stellate cells. 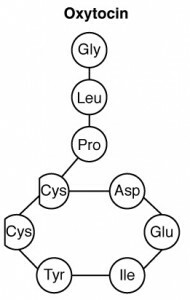 The groups of cells producing hormones are surrounded by a capillary network. 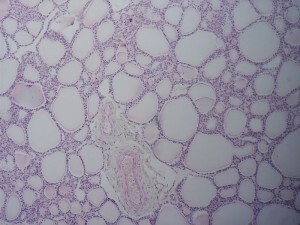 The thyroid (gl. thyroidea) is an important endocrine organ. It influences the metabolism of nearly all body cells with its hormones thyroxine (T4) and triiodothyronine (T3) and plays an important role in the development of the nervous system. Microscopically, the thyroid consists of thyroid follicles. These are lined with a single layer of epithelium, the follicular epithelium. The height of the follicle epithelium varies depending on its functional state. If many hormones are currently produced, the number of epithelial cells is higher. 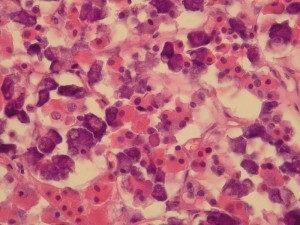 In the follicular lumen, there is a homogeneous mass, the colloid, colored pink in the H & E stain. The colloid contains thyroglobulin, the storage form of the thyroid hormones T3 and T4. 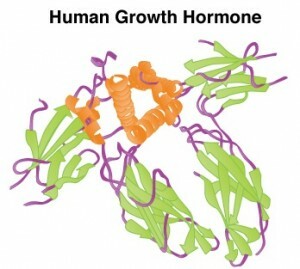 Here, the hormones may be stored outside the cell for up to two weeks. In fibrous septa, located between the follicles, there are blood capillaries and lymphatic vessels. The thyroid is surrounded by a connective tissue capsule on the outside. The protein thyroglobulin is formed by folicular epithelium cells, which transport it to the colloid. Here, it is iodinated to its tyrosine residues. The required iodine is taken with food. In Germany, the demand is 200 μg per day. T4 and T3 are released through the return transport and hydrolysis of thyroglobulin. They consist of two iodinated tyrosine residues, whereby T4 consists of four and T3 of three iodine atoms. They eventually diffuse into the bloodstream from the cytoplasm of the follicular epithelial cell. The functions of the follicular epithelium are regulated through TSH (thyroid stimulating hormone), which is produced by the adenohypophysis. Isolated between the epithelial cells are the C-cells, which do not have any contact to the follicles. They are hardly visible in the H & E stain and are therefore detected by immunohistochemical methods, for instance. C-cells are cells of the neural crest. They migrate to the thyroid through the ultimobranchial body during the embryonic period. The ultimobranchial body regresses in humans before birth. The C-cells produce the peptide hormone calcitonin, the antagonist of the parathyroid hormone of the parathyroid. Calcitonin reduces the calcium level in the blood and promotes the incorporation of calcium into the bones. This effect was previously used therapeutically for the treatment of osteoporosis. An enlargement of the thyroid is called goiter. This enlargement may be an expression of various thyroid diseases. Hypothyroidism (underactive thyroid) may be caused by lack of iodine in the nutrition, for example. Hashimoto’s disease, an autoimmune disease, leads to hypothyroidism as well. Euthyroid goiter occurs during normal hormone production. A goiter may also appear during hyperthyroidism (overactive thyroid). This is especially observed in the case of Graves’ disease. Here, autoantibodies to TSH receptors of the follicular epithelial cells are formed. The parathyroid gland, also referred to as epithelium, can be found in four places in humans: one pair each on the upper and lower thyroid pole. The parathyroid glands (Gll. parathyroideae) are about the size of a grain of wheat and are characterized by their simple histological structure. They produce parahyroid hormones that control the calcium metabolism via vitamin D and calcitonin. 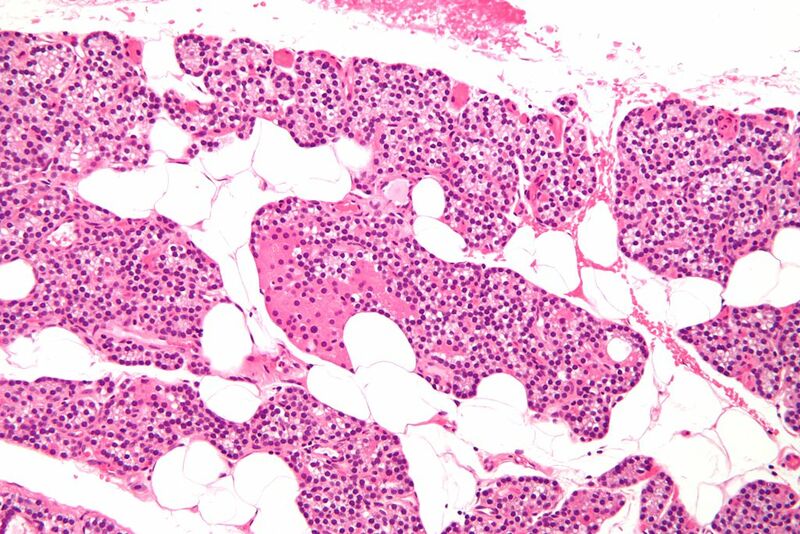 Densely packed, small epithelial cells, which are arranged in balls, are found in the H & E stain. With increasing age, univacuolar fat cells are more frequently found between the epithelial cells. The parathyroid gland is well vascularized, which means that a lot of capillaries can be found. Sometimes, small miniature follicles filled with colloid can also be seen. The endocrine glandular cells of the parathyroid gland are chief cells. There are bright chief cells that are rich in glycogen and are at rest, meaning, they are currently producing little hormone. The dark chief cells, on the other hand, are regarded as the hormonally active cells since they contain more cell organelles. Finally, there is a special form of chief cells, the so-called oxyphil (azidophilic) cells. They are large and rich in mitochondria and have a reddish cytoplasm. They represent less than 3% of the epithelial cells. The epithelial cells form parathyroid hormone. The parathyroid hormone is an important hormone in the calcium and phosphate metabolism. It prevents the decrease of the blood calcium level and indirectly activates the osteoclasts, which transfer calcium out of the bone. Please note: The parathyroid hormone provides calcium in the blood. The paired adrenal glands (gl. suprarenalis) are located to the right and left side on the upper renal pole, like a cap. They are supplied by three arteries and a vein each. On the outside, they are covered by a capsule. The adrenal glands consist of two parts that are different with regard to their evolution, the adrenal medulla and the adrenal cortex. The cortex represents about 80% of the organ and produces, for instance, glucocorticoids like the ‘stress hormone’ cortisol. The smaller medulla produces epinephrine and noradrenaline. 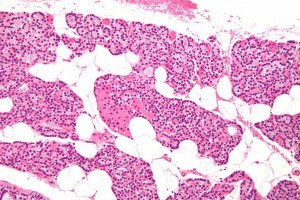 A histological feature in the adrenal medulla are the so-called jugular veins. Zona glomerulosa: epithelial cells form balls or arcades. Here mineralocorticoids (aldosterone) are produced. Zona fasciculata: a wider area, polygonal cells with a bright nucleus and lipid droplets. Produces glucocorticoids (cortisol) under the control of pituitary ACTH. Zona reticularis: branched cell cords with acidophilic cytoplasm; formation of androgens takes place here. These are then converted into testosterone and estrogen in the ovary and testes. The adrenal medulla (medulla) produces epinephrine and (to a lesser extent) noradrenaline. These substances belong to the class of catecholamines. Because of their dyeability, they are also referred to as chromaffin cells. (Other chromaffin cells are, for example, the serotonin-containing cells in the gastrointestinal tract). The medullar cells are modified sympathetic neurons, which do not have an extension. They are, in turn, innervated by preganglionic cholinergic sympathetic neurons. The cells of the adrenal medulla can therefore be regarded as an endocrine sympathetic ganglion as well. It is also called paraganglion suprarenale. Venous plexuses are located between the medullar cells. The larger veins have smooth musculature and are called jugular veins. Inside the medulla, the Vena suprarenalis, the central vein, is located. 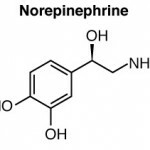 Epinephrine and noradrenaline get into the blood stream through it. 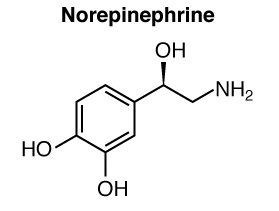 85% of the medullar cells produce epinephrine; 15% produce noradrenaline. Tumors producing catecholamines are called pheochromocytoma. 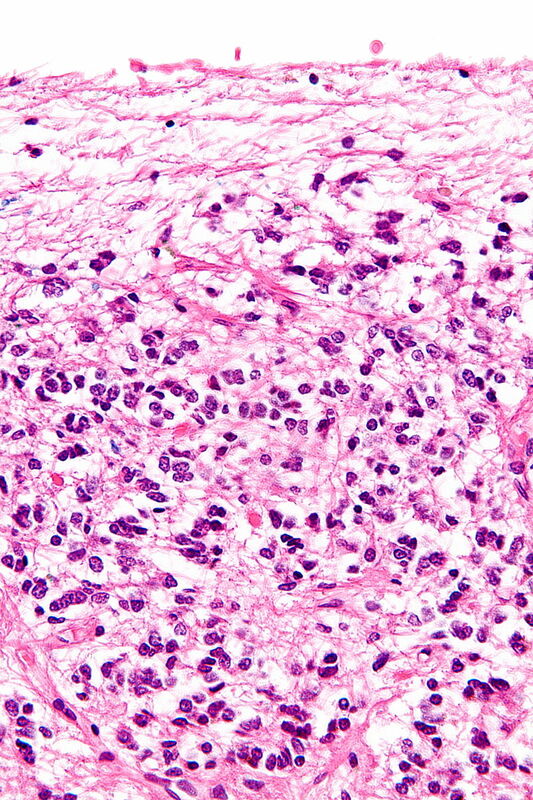 The tumor originates from cells of the adrenal medulla in 90% of the cases. The epiphysis, also referred to as pineal gland or corpus pineale, holds a special status among the endocrine organs. It actually is no gland at all, but rather a light-receptive neuroendocrine organ controlling the circadian rhythm as a part of the midbrain. Pineal cells, the pinealocytes, produce the hormone melatonin. 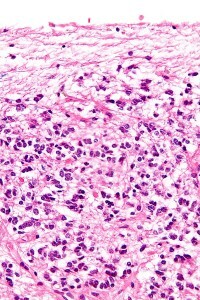 The pinealocytes are surrounded by interstitial glial cells. Melatonin is formed from serotonin, its secretion increases in darkness and is slowed down in daylight. Melatonin is also used for the treatment of insomnia and as an anti-jetlag pill in tablet form. It also serves as an antioxidant, protecting against oxygen radicals. …reduce the basal metabolic rate. …are formed in the C-cells of the thyroid gland. …are stored outside the cells. …are secreted directly into the blood. is a tumor of the adrenal cortex. originates from the adrenal medulla in 90% of the cases. causes a strong facial flush in the patient. 3. Which association is correct? Greenstein, B., & Wood, D. (2011). The Endocrine System at a Glance. Hoboken: John Wiley & Sons. Rushton, L., & Cooley, D. A. (2004). The endocrine system. Philadelphia: Chelsea House Publishers. Sharpey-Schafer, E. A. (1926). The endocrine organs: P. 2. London: Longmans, Green and Co.